Iizuna, Nagano St. Cousair Co., Ltd. (headquarters: Iizuna-machi, Nagano Prefecture), a food manufacturing retailer (Food SPA) with more than 130 specialty stores throughout Japan, including St. Cousair brand stores and Kuze Fuku & Co.,announced today the beginning of sale of its new lineup of Traditional Rich Jam, made at the company's US affiliate St.Cousair(SCOO, located in Newberg, Oregon). This marks the company's third lineup of products produced at its facility in Oregon for sale at its retail stores in Japan. In March of 2015, St.Cousair sent its Director of Overseas Operations, Naoki Kuze, to the West Coast of the United States to conduct market research of the American retail and business food manufacturing industry. 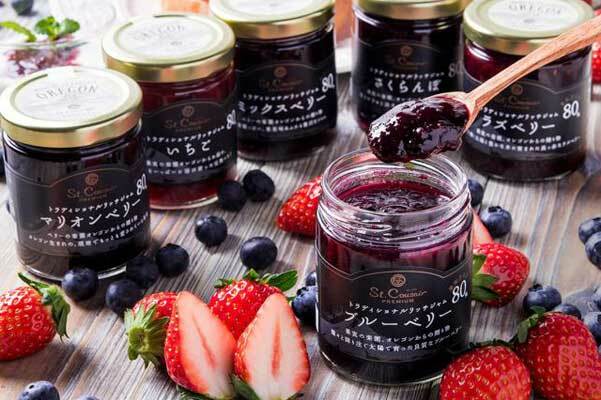 In cooperation with JETRO's national headquarters and its Nagano branch, in April of 2017, St.Cousair acquired Berry Noir Co-Packing, Inc., along with assets, existing business contracts, its processing facilities and 30 acres of farmland. Berry Noir's employees empathized with the management philosophy of St.Cousair, and decided to continue working at the facility. On April 29, 2017,a signing ceremony and closing party was held, making the agreement on acquisition of Berry Noir official. It was conducted with the participation of executives from both companies,officials from the State Government, and representatives from the Japanese Consulate in Portland. On May 1 of that same year, an opening ceremony for the new SCOO was held, attended by executives of St.Cousair, and the next day, operations at the facility proceeded, continuing with co-packing in the US, as well as the production of items for retail sale in St.Cousair's stores in Japan.The first of these products from SCOO was Drinking Vinegar, followed by Blueberry Compote, and now, the Traditional Rich Jam lineup. St.Cousair's new Oregon-made Traditional Rich Jam is created using old-fashioned manufacturing methods, without additives of coagulants such as pectin, thereby bringing out the rich taste of the jam's wholesome ingredients. The jams' fruit content is 80%, and this high fruit content is evident in the jam's sweetness and hearty flavor. * The fruit used in this new lineup is entirely from the vicinity of SCOO in the State of Oregon. Available varieties are blueberry, raspberry, marionberry (a type of blackberry grown in Oregon), mixed berry (marionberry, strawberry, and blueberry), strawberry and cherry. Six varieties in total (each 200g / 490 yen + tax). * The Japanese Ministry of Agriculture, Forestry and Fisheries stipulates that the fruit content of jams be 33% or more. St.Cousair's popular All Fruit Jams contain around 50% fruit. The next product from SCOO will be St.Cousair's lineup of pasta sauces, using high quality tomatoes grown in the US state of California, one of the world's leading tomato production regions. Sales online and at St.Cousair's retail stores in Japan are scheduled to begin as early as mid-March 2018. St.Cousair hopes to make the best use of the merits of its manufacturing base in the US, and in the coming months, the company will be transferring 50% of its production volume from its facility in Iizuna, Nagano to SCOO in Oregon. The company will continue to produce food and beverages utilizing the rich resources that Oregon and the surrounding regions have to offer.